The ‘Storm Desmond’ event of the 5th December 2015 led to 60 SLH homes being flooded from a range of sources including; surface water run-off from the fells, river flooding and ground water flooding. 39 households required alternative temporary accommodation with Kendal being the worst affected area. Two sheltered schemes were also badly affected including a Mountain Rescue evacuation of elderly residents from Birthwaite in Windermere. 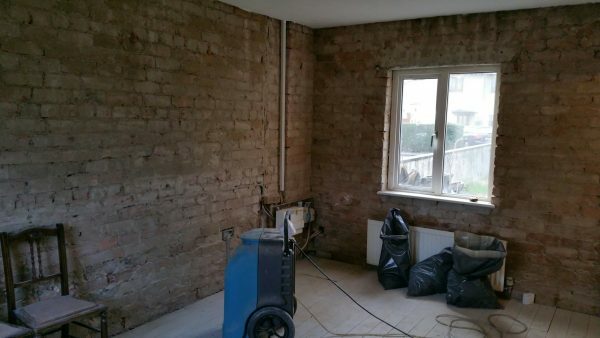 The refurbishment took 9 months with all tenants back in their homes by the summer of 2016. The cost of repairing the homes after flood damage was over £2M which was undertaken by SLH and its contractors. Unfortunately a lot of tenants did not have contents insurance and many needed vital support from the voluntary sector. John Mansergh, Assistant Director at South Lakes Housing said “There are many lessons to be learned but climate change will bring more events like this in the future so flooding is top of our risk management strategy. We have a programme of flood resilience activity underway, we have good dialogue with the various agencies involved and are helping tenants to access affordable contents insurance. The contribution of community organisations such as; Age UK South Lakeland, the Red Cross, Sandylands Methodist Church, Eden Flood Volunteers and the Cumbria Community Foundation cannot be underestimated and we thank them for being there for tenants both during the floods and for the months that followed. The event also brought the best out of our committed staff”. One of the consequences of the floods remains community anxiety towards new developments which is entirely understandable. Engineered drainage solutions in the vast majority of cases perform much better than existing green spaces which once saturated just moves water along. We have a housing crisis here in South Lakeland, people need affordable housing and new housing developments should be part of the solution for managing future flood risk”. 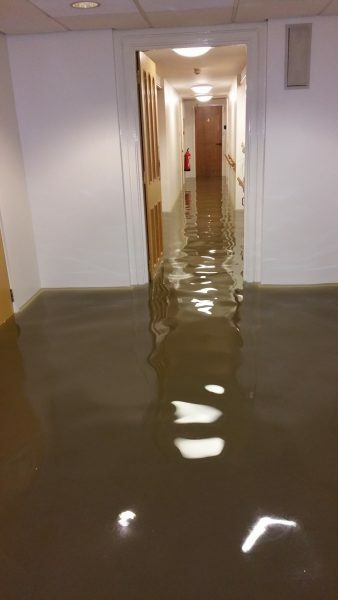 Flood waters enter the basement of Edgecombe Court sheltered housing scheme in Kendal. 4 flats suffered extensive damage. 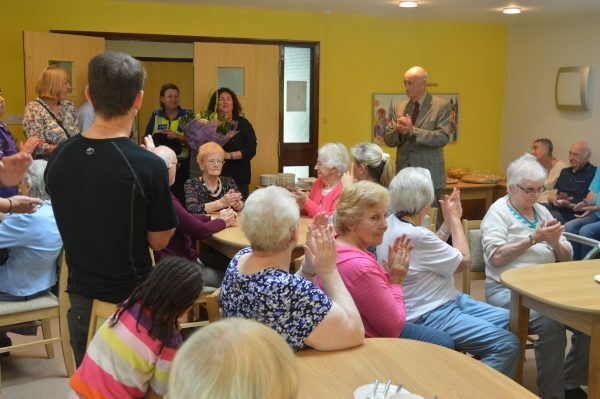 SLH Chairman John Holmes and CEO Cath Purdy thank residents of Birthwaite Sheltered Housing Scheme in Windermere for their patience as the flood refurbishment works were completed in August 2016. 8 flats were damaged along with the communal lounge and kitchen areas where many social activities take place.